"There were other witnesses who believed that Emma had previously attempted to kill McVicar on their trip to San Francisco at the Lexington Lodging House on Eddy Street. A gentleman. Mr. E. Lord, who owned a hardware store in town claimed Emma had purchased a meat cleaver from his store around the same time period. After hearing of the murder in Stockton, he revealed his recollection of his encounter with Emma, as well as his suspicions. Also, a Japanese servant, Harry Akazaki, who was attending the rooms at the hotel they had stayed in, had his own account to share with The San Francisco Call. 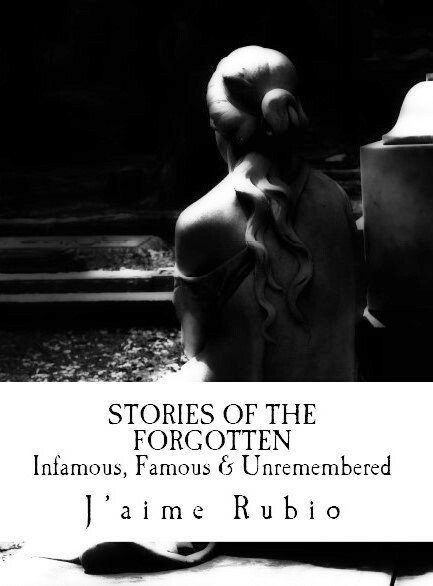 Whatever may have transpired that evening in San Francisco, it seemed to be more than just a mere coincidence that only two weeks later McVicar would be found dead. The Amador Dispatch also mentioned some events leading up to McVicar's death, before the couple ended up together in Stockton during his final days and hours. “From the Record’s correspondent at Jamestown this morning it was learned that the woman passed there as McVicar’s wife, but that she spent the most of her time elsewhere and only visited him at their home at the Rawhide mine occasionally. McVicar came to Jamestown about two years ago. He was a timber man at the Rawhide mine. He was a stead and taciturn and he saved his money. Two weeks ago his supposed wife told him that her mother, who lived near Jackson, was wealthy. That she had a large ranch and several teams engaged in hauling freight to the Kennedy Mine and that she wished McVicar to give up his job at the Rawhide and come to take charge of her ranch and teams. The trip to Stockton had Emma and McVicar staying at the California Lodging House, room 97. On Friday afternoon, the couple visited Breuner's furniture store to purchase a large amount of goods. McVicar opened an account on credit and gave instructions to ship all the purchases to Jamestown. They then spent the rest of the evening together, ate dinner and went to bed. It was in the early morning hours before McVicar had even eaten breakfast, that he met his demise. Emma came back to the lodging house and to her room, when the delivery man Charley Berry came to bring her the trunk. Berry claimed that she would only open the door wide enough to slide the trunk into the room and then she closed it. She told him to come back in an hour because she needed to pack her dishes in it in order to catch the 1:20 train to Jamestown. Berry told her she would never make it because it was already past noon, but she was very adamant she had time. Berry came back within the hour but she was not ready so he took a lunch break. When he finally came back saw that Emma was ready, he noticed that the trunk was too heavy. He had to get another person to help him load the trunk to the truck in order to deliver it to the train depot. Emma left with an unidentified man and the delivery men met them at the station. She told Berry that since they missed the earlier train, they would take the later train by way of Galt to reach their destination, although she and her "mystery man" secretly planned to board a different train all together. According to The San Francisco Call, the daughter of Officer Van Landingham, who was staying in the room just across the hall from Emma, claimed that "she saw a smaller man that was not the deceased" who was coming and going from the room. A baggage handler also saw the same man at the train station, who seemed nervous. They described him as a small man with a black moustache. At the train station, Emma wrapped the trunk with the rope she had purchased earlier and then gave instructions for the trunk to be shipped on the train to Jamestown; however, she failed to register the trunk properly. So when she and her new male companion boarded the train going westbound to the bay area, the trunk which was supposed to go to Jamestown, didn't go anywhere at all. In fact, it sat there in the sun for hours before baggage handlers realized that it was abandoned. The trunk was then put aside. Eventually employees noticed a foul smell which piqued their interest into finding out just what was causing the stench. John Thompson, who was the baggage master, was notified by N. Vizelich, another employee who had noticed the odor coming from the trunk. Thompson quickly alerted the authorities. The first officer of the law on this case was Police Captain John Walker. 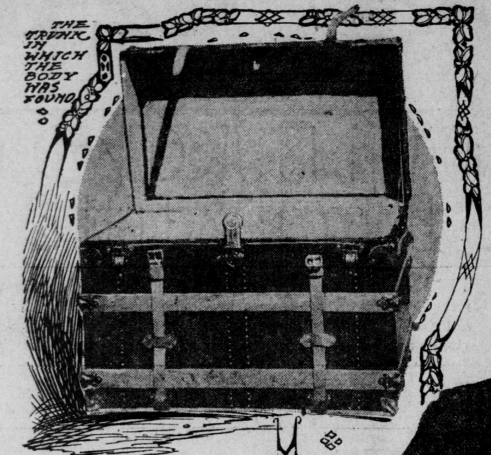 After obtaining a warrant signed by District Attorney Norton, the trunk was then opened. The ghastly sight of Albert McVicar’s body was revealed to them and the hunt for his murderer began. McVicar's corpse was found curled up with wounds on his head and bruises. His nose had been completely fractured and his head was facing the bottom right hand side of the trunk while his body and arms and legs were opposite the top left side of the trunk diagonally. Blood that poured from his head and nose settled at the bottom corner of the trunk and covered over the clothing that had been packed with McVicar's body to keep the body from shifting around. While the authorities were investigating the scene where they discovered McVicar’s body, Emma had traveled to San Francisco to spend time with a man she knew by the name of Joseph Healy. According to Healy’s statements later on, Emma had allegedly sent him a telegram that read, “Leave on the 2:15 train, meet me at the Royal House.” The newspapers reported that Healy arrived at the Royal House located at 126 Ellis Street, but she was not there, so he went over to 5th and Market Street to the cigar shop. Emma snuck up behind him and tapped him on the shoulder as he was putting a nickel in the machine on the counter. Emma told Healy that she wanted to bring him back his ring and “be on the square” with him, so they went over to a restaurant to talk. During their discussion Emma turned around and begged him to allow her to keep the ring, but offered him what it was worth in cash. When they arrived, Emma broke down and told him that McVicar had died and that she couldn’t give him the ring as all her belongings were packed away. She also mentioned that McVicar had changed his life insurance policy and that his mother was the beneficiary. She claimed that she made an arrangement with McVicar’s brother to get $1,000 out of the money, while his mother would get $4,000. Healy had recalled two weeks prior to this conversation, Emma had called him and told him that McVicar had not long to live. This was around the same time that he had fallen ill and Dr. Dillon had saved him. When Healy had inquired as to what McVicar was suffering from, Emma plainly suggested it was “miner’s consumption.” Healy had heard Emma use that excuse before, when describing how her other husband William S. Williams had died in Arizona. With all the clues right in front of him, Healy was either oblivious to the obvious or just incapable of telling the truth. He claimed that he left Emma at the Royal House once again and promised to return the next morning. Healy said that she acted very calmly and unaffected by the newspaper headline. After that they left to the Presidio for lunch, eating cracked crab and soda water. After 1 p.m., Healy returned her to her room at the Royal Hotel, where she went upstairs and retrieved the ring and returned it to him. She also asked him toescort her to the train station to say goodbye. Healy admitted that he saw her off on the 3 p.m. Santa Fe train to Stockton, Sunday afternoon. According to the San Francisco Call dated March 27, 1906, authorities assumed Joseph Healy was none other than Emma’s accomplice, “Mr. Miller.” However, based on Mr. Healy’s journal which provided a well-documented accounting of his whereabouts for the past year or so, and after learning that he was well spoken of in the community, having “a reputation for integrity, and good habits…a church member, never drinks and in his talk displays a rare innocence of heart,” they believed they were at a dead end. According to Healy, he met Emma in January of 1904, where he quickly pursued in courting her. He was enamored by this strong, vivacious woman, as he was just a young man, a plumber by trade, still living with his parents and younger siblings at 1152 Florida Street, in San Francisco. 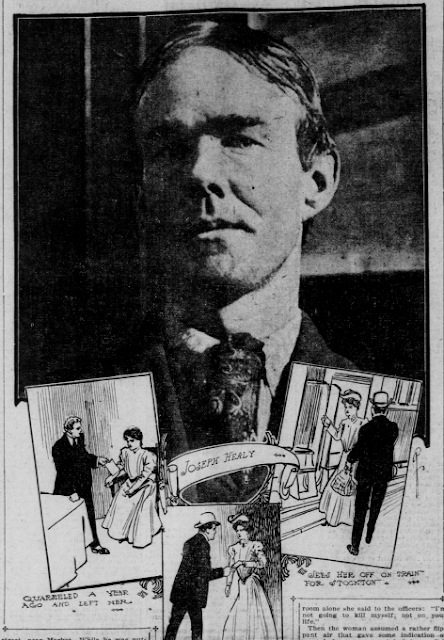 Knowing she was out of his league, Healy still did not stop his attempts to woo Emma, even going so far as to purchase a diamond ring to propose marriage in April of 1904, to which Emma declined the offer. By June, she had changed her mind and the wedding date was set for April 25, 1905, despite the fact she was still married to McVicar! Six days before the scheduled marriage date, Healy’s mother received an anonymous note which soiled Emma’s reputation, and persuaded Healy’s family to convince him to break it off with Emma. It was speculated that Emma herself wrote the letter, in hopes that she could get out of the engagement from Healy. On May 21, 1905, Healy had traveled all the way up to Emma’s parent’s home in Sutter Creek to demand his ring be returned, but using her power of persuasion, Emma was able to get Healy to leave, without the ring. He later heard about her marriage to McVicar and figured that she would leave him alone for good. Back in Stockton, Sheriff Walter F. Sibley and Amador County Deputy Sheriff Henry E. Kay decided to search for Emma and her unknown accomplice. Kay and Sibley decided to travel to Amador County see if Emma was hiding out at her mother's ranch which was located near Ridge Road in between Jackson and Sutter Creek. 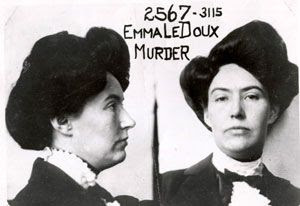 Unfortunately, the authorities could find no trace of her there, although news got out to Emma's fourth husband, Eugene LeDoux of what had taken place in Stockton. 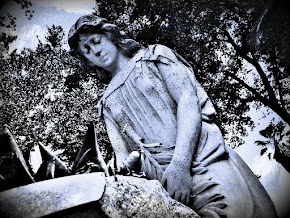 According to the book, “Murder by the Bay,” by Charles F. Adams, among the items found on Emma when she was arrested were bottles of carbolic acid, morphine, cyanide of potassium, the meat cleaver she had purchased in San Francisco, a knife, and a small saw, along with her other personal effects. She was accompanied to the depot where she was sent back to Stockton to be placed in jail on the charge of murder. 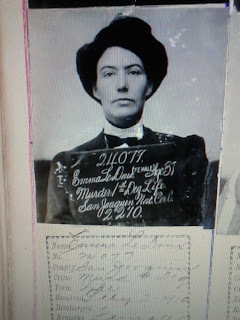 It was reported by the photographer taking her mug shots that Emma acted as if she was "modeling in a gallery" and not like a woman who had just been charged with the murder of her husband. She acted very nonchalant and unaffected, showing no emotion during the entire booking process. Emma claimed that the murder was done by a man named Mr. Miller, and that he had known McVicar in Arizona. Her version of the story states that Miller ran into the couple in Stockton and came back to the lodging house with them after they had went out to dinner together. She claimed that the two men were drinking and talking about gambling before they started an argument. This was prior to her leaving the room. When she came back, she discovered that McVicar was very ill and vomiting when he suddenly fell over dead on the bed. She claimed Miller threatened to kill her unless she went along with "disposing" of McVicar's body for him. She was adamant that she had nothing to do with the murder except for the placing of his body in the trunk, claiming that Miller had threatened her with a pistol and a knife, swearing he would kill her if she did not do as he said. admitted that Emma told him she needed his help in shipping McVicar's body back to his brother in Colorado, but claimed to have no part in the murder. The San Francisco Call, dated March 28, 1906, quotes Joe Healy’s statement: "I had told all that I knew about the woman already. No, I did not see her when I was in Stockton and I don't want to see her again. I am a pretty lucky fellow. Supposing that I had married her, and had my life insured. I can't make the woman out. She liked me, I think. But I guess she would have done with me what she did with the others. I am an awfully lucky man." 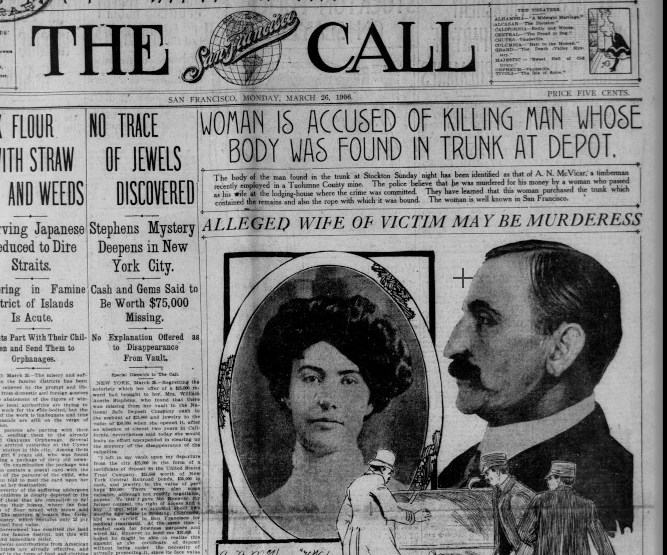 Interesting to note, Emma claimed that this mysterious Mr. Miller, whom she adamantly denied was Mr. Healy, forced her to help him dispose of McVicar’s body at the train depot. Witnesses saw a man purchase two tickets for the train headed to Jackson, yet Emma and Mr. Miller jumped on the train headed westbound to the bay area. As Emma stated to the authorities, although she and Mr. Miller were on the same train, they sat separately until reaching Niles. It was at Niles when they changed seats and sat together the rest of the trip. If she had really been forced to cover up a murder, and had the ability to sit alone from Stockton all the way to Niles, she would have had numerous opportunities to flee and alert the authorities.